At PEMF Auckland we are dedicated to helping you feel much better through the Personal Energy Multi-dimensional Field sessions, which may include the use of the Aureon unit or a seperate unit generating scalar field. Relieve stress, anxiety and depression. Improve energy, circulation, blood and tissue oxygenation, sleep quality, cellular detoxification and the ability to regenerate cells. All of this is often called anti-ageing. The Aureon pictured here is a PEMF [Pulsed Electro-Magnetic Field] device. The energy pulsed through the Aureon unit has the potential to induce the body to heal itself. This is a very natural, painless treatment. It is like having an inner healing energy massage treatment and your body uses the energy to help you back to wellness. The Aureon produces a rising and falling frequency range of 0 – 5KHz. Scalar fields, informational and intentional are inherent in the Aureon. Scientific studies have shown that Earth has a resonating frequency and in turn the human brain should also be resonating to that frequency, but due to many reasons, such as stress, toxins in our environment and body, disturbances to our energy field from radiation, energy from our electronic devices, living our lives in such a way that we are not in touch with the earth, we have become out of resonance with the very energy which maintains our health. 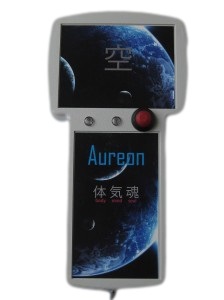 The Aureon helps us to restore ourselves to health through its energy. I have seen the difference in people who have come to me for treatments with the re-tuning and balancing achieved during even one treatment – they report successful stress and anxiety relief, deep relaxation occurs, people sleep better, more energy is experienced, clarity of thought, inspiration and answers to problems occurs, aches and pains disappear, feelings of inner strength and physical strength are experienced. Some people feel they regain their connection to Source Energy, their spiritual centre. It is interesting to note that people feel energy go to old and new injury sites. Also, according to clinical studies, the treatments are known to increase the rate of recovery following operations or damage to parts of the body. The Personal Energy Multi-Dimensional Field sessions may help in reducing the duration and cost of other treatments you may be receiving. Contact me to make an appointment for your first treatment, to help you feel much better! Refer to Treatment Sessions and Distant Energy Sessions for options – in person or from a distance.